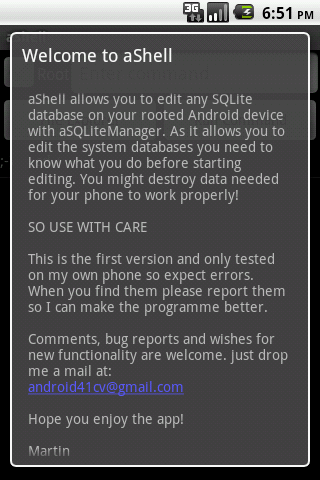 aShell is my Android app for secure editing of Android system and application databases on rooted and databases on sdcard on unrootet phones using aSQLiteManager. 7 april 2013 - Now downloaded more than 25,000 times. 24 march 2013 - Version 4.0 of aSQLiteManager released on Google Play as the donate version. If you buy this version you can edit system databases without aShell. 14 march 2013 - Version 1.1 of the aShell is released on Google Play Bug release. 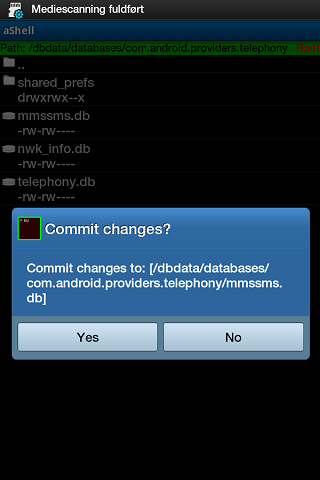 Now also works on devices where the user must acknowledge each time the app wants to execute a su command (for some reason mainly Motorola phones). On my Samsung and HTC devices the apps are granted su privileges for a longer period of time or for good. The command used to retrieve directory listing only waited ½ sec. and that was not long enough for the users to grant the privilege. The programme is still under development so please expect some bugs. If you experience unexpected behaveior or have sugestions for new functionality don't hisitate to contact me by mail. 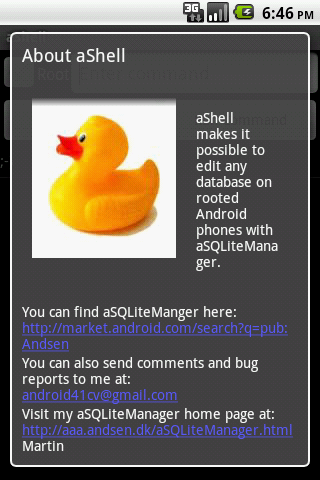 Some users want the root access to be included in aSQLiteManager. That wont happen before aShell reach production stability. To make editing as secure as possible the database is copied to temporary location (/mnt/sdcard/aSQLiteManager) together with a backup copy of the database (with a bck extension) and edited there. If you, after editing want to commit the changes you made the edited database can be copied to its original location replacing the orriginal data. If the editing later shows to have unwanted effects the backup copy can be restored (currently not with aShell but I'm working on that) bringing the phone back to the condition before editing the database. The editing is done using aSQLiteManager. The first version was released on Android Market on July 12 2011. 12 July 2011 version 05. released on Google Market. Currently aShell is translated to English and Danish (other translations are welcome). The following screen dumps shows what is possible with the aShell. Click on a image to see it in full size. If you know of more - let me know! Any wishes for coming versions of aShell? Drop me a mail!